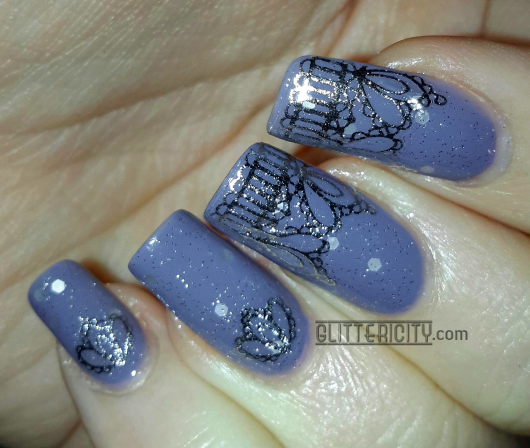 The silver lace is all decals--these from Born Pretty Store, to be exact. There are so many different patterns and colours to choose from! 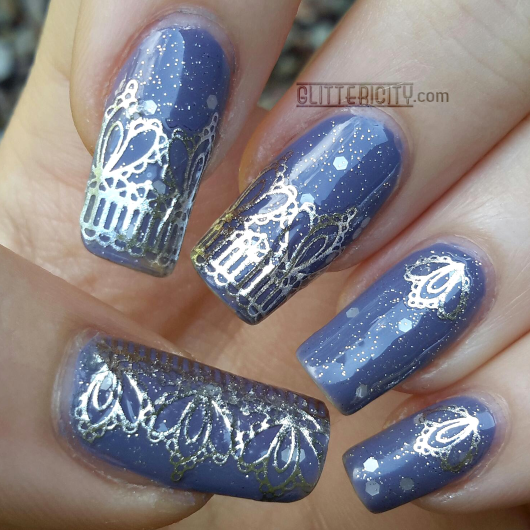 They are good-quality, thin-yet-strong stickers with a slight 3D effect on the pattern. The adhesive sticks well, yet I was able to lift and re-position them without them tearing or becoming less sticky. They were perfectly flat until I topcoated! 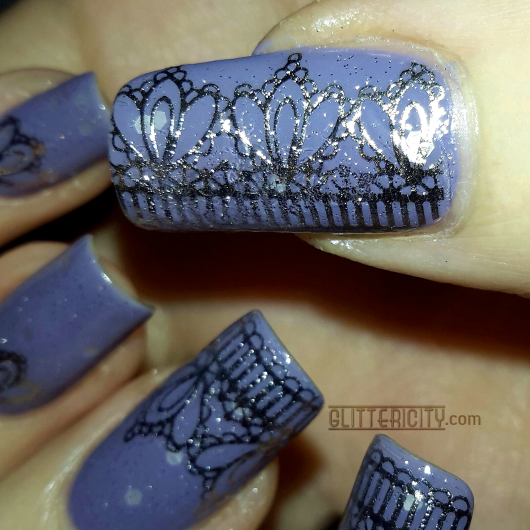 Do not use Seche Vite (or any other fast-drying topcoat that shrinks) on these... see that wrinkle on the middle finger? 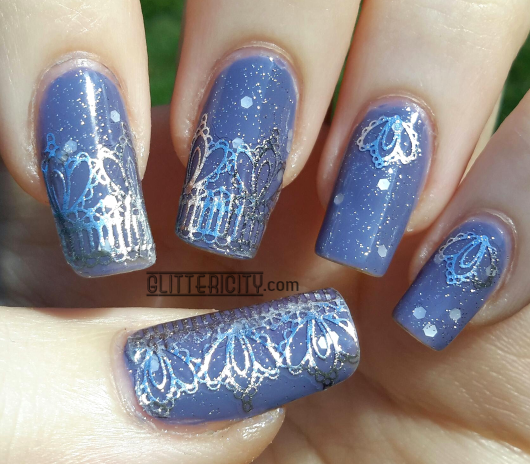 It shrunk the decals a little just like it can do with polish :( they still look really nice though! Next time I'll use a different topcoat, for sure. ^and after. See, they're still pretty! The silver is SO shiny and reflective. I'm really digging these, and definitely want to get more of them. They have tons of nice patterns. 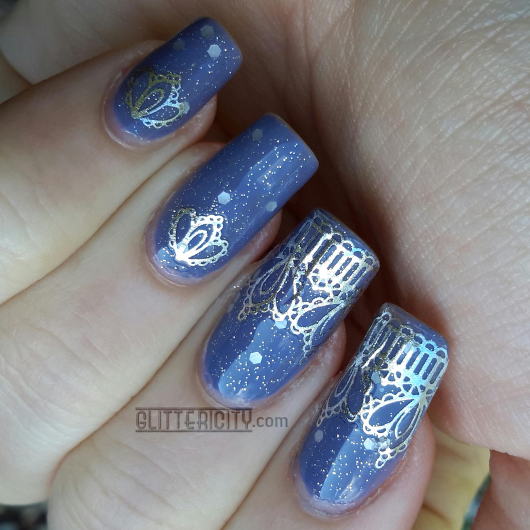 I could see these being used in a wedding or other formal manicure. As I mentioned before, these decals (as well as tons of others) can be found here! Use discount code CITYG10 to get 10% off your order. Ohhh those are pretty! And I love that base color too!!! I have been meaning to order some Zoya colors.